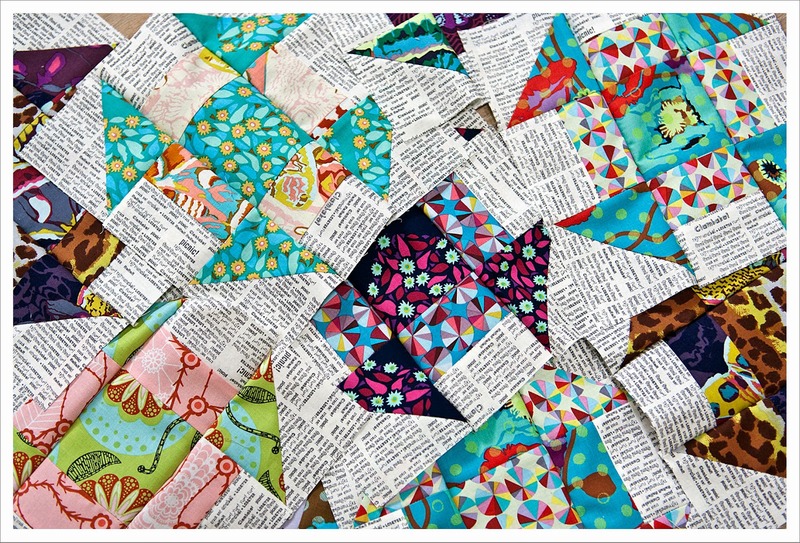 I have long been wanting to make a quilt with the traditional churn dash block. I had the pleasure to sew the block once or twice before when I was in the Brit Bee but never in a larger project. It is such an effective quilt block and makes me rather happy every time I see one. This new project serves two purposes. It is actually a quilt commissioned by a client in Germany and it will also be the preparation for a new class at the Village Haberdashery that I intend to teach in January or February (date not set yet). It will be a class that spans over 6 weeks or so where we will design a churn dash quilt together, learn about quilt math, half square triangles, rectangles, how to layout blocks and sew the top together and finally quilt and bind. It should be great fun and is a class designed for everybody who already dipped their toes into quilting and who wants more ! I chose Anna-Maria Horner's Field Study for this project that I purchased back in September 2012. This is a really beautiful collection full of life and the patterns and colours are stunning. It is bright yet coherent and a little adventurous with the animal prints in between. As background fabric I decided to choose a warm print rather than a harsh white and went for the text print of the Crabtastic collection by the designer Maude Asbury for Blend fabric ( I did a project for Annie a while back with this collection, see here). It adds a modern touch to the traditional block. The blocks are all 9" finished size and the quilt will be a single which is a size I actually haven't done before. Looking forward to hearing about the class. Amazing! Gorgeous fabrics and i love churn dash blocks! The churn dash is still one of my most favourite blocks, this will be wonderful. I am looking forward to seeing how the text looks as the background, I will be watching for the finished quilt. Loving how it looks so far. love the blocks, the news print works brilliantly.